Kale may be my new food addiction. I can’t get it out of my mind and continue to think of recipes that kale goes well in. This is a delicious recipe. The ingredients are simple yet the flavors are fantastic. The beans were simmered with onions and garlic and the cooking liquid is combined with the chicken stock, thus, giving the broth more complexity. 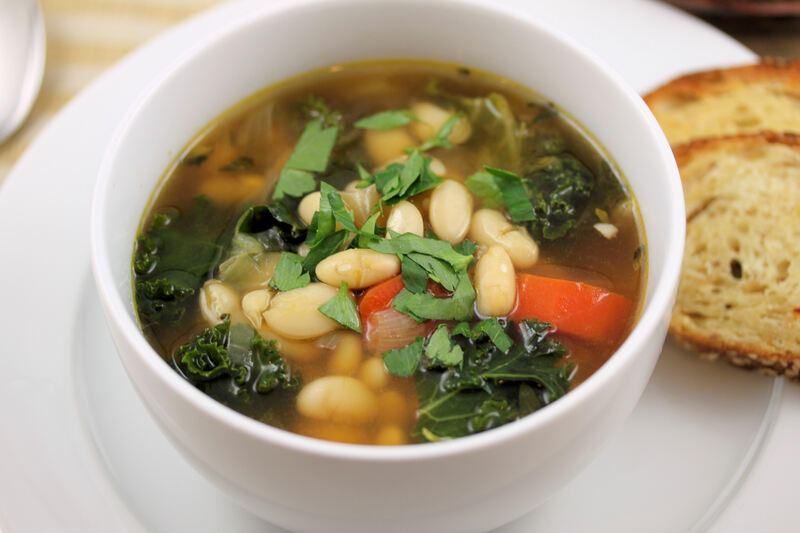 combine the rinsed white beans, sliced onion, 4 whole garlic cloves, 1 bay leaf, and salt and pepper to taste, in a large sauce pan or stock pot. pour in 8-10 cups water and bring to a boil. cook beans per package instructions. remove pot from heat and let sit for 30 minutes. after 30 minutes, strain the beans with the onions and garlic cloves, while reserving the cooking liquids. remove the bayleaves and set both the beans and liquids aside. in a large 4 qt sauce pan, heat the extra virgin olive oil to medium high heat and add the carrots and onions. saute until they begin to soften, 5-7 minutes. add the garlic, bay leaf, and parsley and cook for a couple minutes longer. add the chicken stock and the liquid from the beans and bring to a boil. season with the red chili flakes and kosher salt and freshly ground pepper if needed. reduce the heat to a medium-low simmer. add the kale and beans with the onions and garlic cloves. simmer until the kale has softened and is tender, about 10 minutes. remove the bay leaves from the soup. 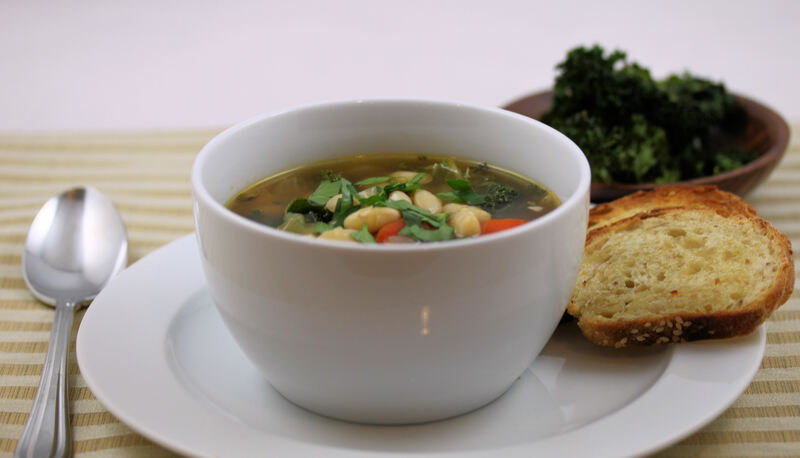 serve the soup in individual bowls and garnish with the remaining chopped parsley and diced chorizo. sprinkle with fresly grated parmesan and serve with fresh bread or toasted bread. 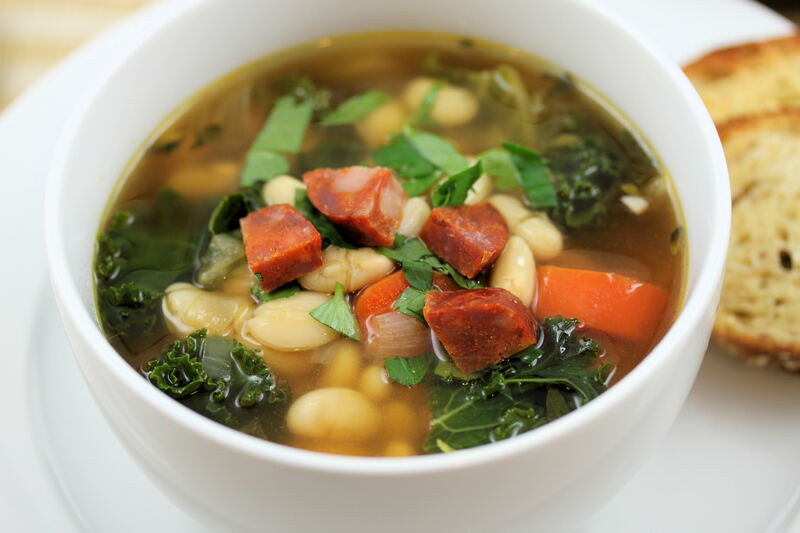 This entry was posted in comfort food, healthy options, italian, main course and dinner, soups and stews and tagged bean soup, chorizo and beans, game day, italian recipes, kale and beans, kale recipes, soup recipes, soups and stews, tuscan kale and bean soup, white bean and kale soup. Bookmark the permalink. I made this exactly as described. Fantastic dish! The garnish of chorizo and parmasan was the perfect compliment. This is a keeper. I didn’t follow directions …of course…but this sure sounds delicious. I will next time.